How can you know if an area is a good place to invest or if it is likely to decrease in value? Successful property investors know the areas they are investing in. How do you know if an area is a good place to invest in? So you want to invest in property and you are looking at a variety of different suburbs to invest in, how do you actually know if the suburb you choose is a good suburb to invest in, that will likely increase in value or if it is a bad suburb that is very risky and may decrease in value? Hi, I am Ryan from OnProperty.com.au, helping you find positive cash flow properties. This month we are talking all about research for the launch of my new course Advanced Property Research which you can check out at OnProperty.com.au/suburb. Now, I just want to put a disclaimer out there that this is probably not the best way to discover if an area is a good place to invest. The best way is probably to get access to hundreds of different data points and be a super nerd and understand exactly how to analyze them and analyze the trends and know everything to do with the suburb being like a super computer. But most of us cannot do that and most of us can only understand what a few different data points from an area mean. So this is going to be a good strategy for a lot of people out there especially if you are not of how to do a lot of stuff with research. But for those of you who are super smart, you can obviously take this further and go into more detail. 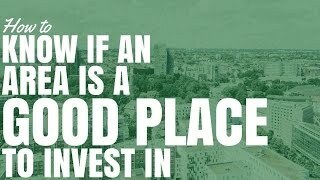 So the first thing that I think you should do when looking for a good place to invest is to find good. And this starts by actually understanding your financial goals and your lifestyle goals and understanding what sort of property and what sort of area is going to move you towards those goals as quickly as possible. For one person, they might just want an area that is extremely robust and low risk because they just want to maintain their money and their portfolio and maybe generate some cash flow as well. Other people might be after fast equity growth because they are making the bulk of their income from their property portfolio and they want to be able to expand quickly. So depending on who you are and depending on your goals, the definition of good area is going to change. So it is important to understand what your financial goals are, what is the property investment strategy that you have chosen to achieve those goals. And therefore what kind of suburb are you looking for that fits in with your property investment strategy. So sit down, take some time to think about what do you actually want to achieve from the property, what strategy are you going to use – is it buy-and-hold, is it positive cash flow, is it renovation, all these sort of stuff. And then try and work out what is a good suburb for renovation or positive cash flow or for buy-and-hold. So first, understand what is good. For most people, I think, what is going to be helpful when looking for a good suburb is to try and minimize your risks and as well we want to maximize our return but I think that for a lot of people should be secondary to actually minimizing our risks. Because a lot of people go in and they are looking at a suburb and they are just looking at the upside. We get our greed on and we are thinking about how much money we can make from this deal and we are not thinking about the possibilities of things going wrong. So for a lot of people, I think minimizing their risks and focusing on the risks of an area to assess whether or not it is a good place to invest is probably the best place to start. And then after you have assessed the risk then you can look at data points of the area that indicate that you may be able to get maximum returns for the area. So to do this, we want to look for what I like to call red flags. These are risk aspects of an area. An example of this would be a high vacancy rate in an area. It would be a red flag that that area is oversupplied and may not be the best place to invest in. There are a lot of different red flags that you want to look for. You want to look for capital growth trends in the area. I especially get worried when an area has decreased in the last 12 months and especially when it has decreased significantly in the last 12 months. So when looking at capital growth trends, I will be aware that if an area is showing some abnormality in capital growth that could be a red flag. A red flag does not mean do not invest in this area. It just means do more research to understand why the capital growth trend is happening the way that it is happening. You can also look for a higher increase in vacancy rates. It is a red flag for an area. So if vacancy rates are actually increasing over time then that indicates that there is either more and more supply or there is less and less demand for properties in the area. And that can be a red flag. Population decline can also be a red flag for an area and high vendo discounts. A vendo discount is how much a property is discounted compared to its listing price. So if you list a property for a million dollars and you sell it for $950,000, then your vendo discount is 5%. So if vendo discounts of an area is quite high then that could indicate that there is lack of demand or there is excess supply in the area because people are being forced to discount their property in order to sell. This means prices can go down over time. So there are a couple of red flags to look for: poor capital growth trends, high and increasing vacancy rates, population decline, and high vendo discounts. And there are a bunch of other red flags that you can look for like days on market and things like that. But if you start with those 4, that is a great place to start. And I do actually have a checklist which has 10 main indicating factors of an area as well as 5 secondary factors that you can go through and fill out. That is available for you inside the Advanced Suburb Research Course which you can check out at OnProperty.com.au/suburb. And in that course I also have videos. I go through each data point in detail to tell you what to look for as well as what actually classifies a red flag and what should you be worried about. So if you need help understanding an area, understanding red flags of an area, check out that course on OnProperty.com.au/suburb. Now that we have gone through and we have collected our data and we have found a couple of red flags, I find that the less red flags an area has the better chance that you found a good area. Almost every area that I have researched seems to have at least 1 red flag or 1 potential issue with the area. But when I researched an area that is a poor area to invest in, something like Port Hedland in Western Australia, which has decreased about 16%, I think the last I looked, in the last 12 months. So something like Port Hedland has a whole bunch of red flags when we look at that area. And so the more red flags an area has, the more likely it is not going to be a good suburb to invest in. And then the less red flags an area has, the more likely it is to be a good suburb because there is less risks associated with that area. So by looking for red flags and then identifying suburbs with fewer red flags than other suburbs, that kind of indicates that this could potentially be a good area to invest. After you have collected data, it is always worthwhile doing extra research. And if you are seriously considering investing in an area then you should be talking to real estate agents. You should check the council websites to find out what developments are happening in the area. You should be assessing properties on a regular basis to see what is happening in the market, what is available and there are a lot of the research that you can do which we will not get into today. But yes, infrastructure projects, development plans, Bunnings, Coles and Woolies, if they have moved into an area. Often people assume that if Bunnings or Woolies or Coles or Audi have moved into an area, then they have actually done some research to move into a growing area. That means they are going to increase their profits into the future. So if those things are starting to move into an area then that is obviously a good sign as well and could potentially an indicator of a good suburb. As well as if you see cafes and restaurants and the street shops improving in a suburb and becoming better shops then that is obviously going to increase the desirability of an area which can also indicate a good suburb. So go to the suburb, drink some coffee. If it is good coffee then you know that could be an indicator. Obviously that is just one small indicator of many. So do not just have one good espresso and think, “I am going to invest in this area.” But you understand what I mean. Do look at the data but then also do some speculative research, talk to real estate agents, look in at Coles or Woolies or Bunnings or something like that. Also, look at the shops and cafes and stuff in the area. So how do you know if an area is a good place to invest. Well, for a lot of people a good area will be one with minimal risks, so minimal red flags. And also, everyone with good signs that the demand exceeds the supply in the area. So there are more people who want to buy in the area than there are properties to buy. I hope that this has been helpful, helping you understand how to identify good suburbs and how to avoid bad suburbs. You can check out my full course on Advanced Suburb Research if you are serious about investing in property and ready to take the next step. this course will help you understand suburbs and find the best suburbs to invest in. Check out OnProperty.com.au/suburb. Until next time guys, stay positive!